Becoming invisible with your surroundings is only one type of camouflage. Camofleurs call this high similarity or blending camouflage. But camouflage can also take the opposite approach. Think about zebras: it’s hypothesized that their stripes make it difficult for a predator to distinguish one from another when the zebras are in a large herd. The stripes also might make zebras less attractive to blood sucking horseflies. This is called disruptive camouflage. 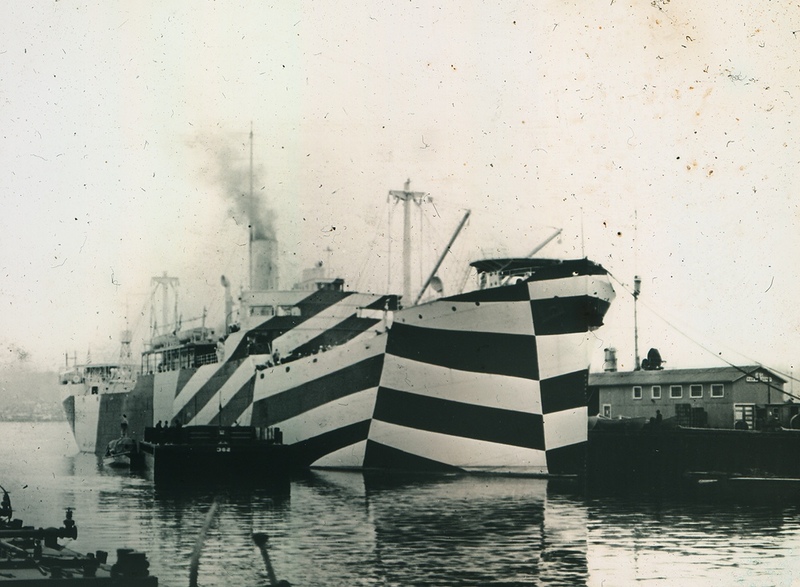 When it comes to humans, the greatest, most jaw-droppingly spectacular application of disruptive camouflage was called Dazzle. 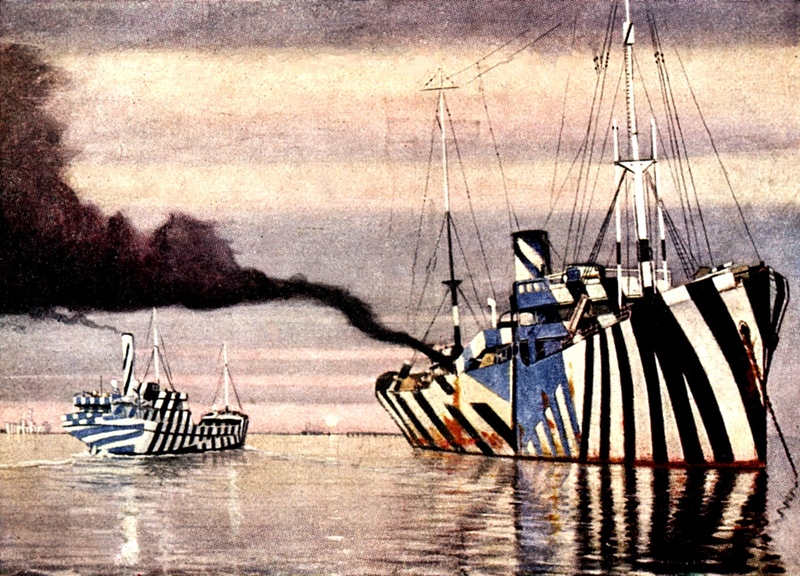 Dazzle painting emerged in the 1910s as design solution to a very dire problem: American and British ships were being sunk left and right by German U-Boats. 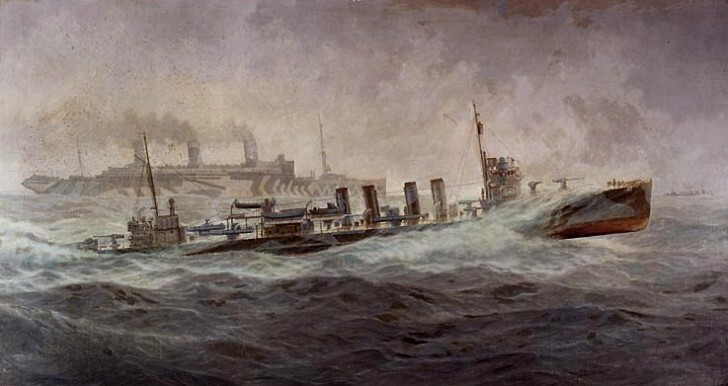 England needed to import supplies to fight the Central Powers, and these ships were sitting ducks in the Atlantic Ocean. They needed a way to fend off the torpedoes. Conventional high-similarity camouflage just doesn’t work in the open sea. Conditions like the color of the sky, cloud cover, and wave height change all the time, not to mention the fact that there’s no way to hide all the smoke left by the ships’ smoke stacks. 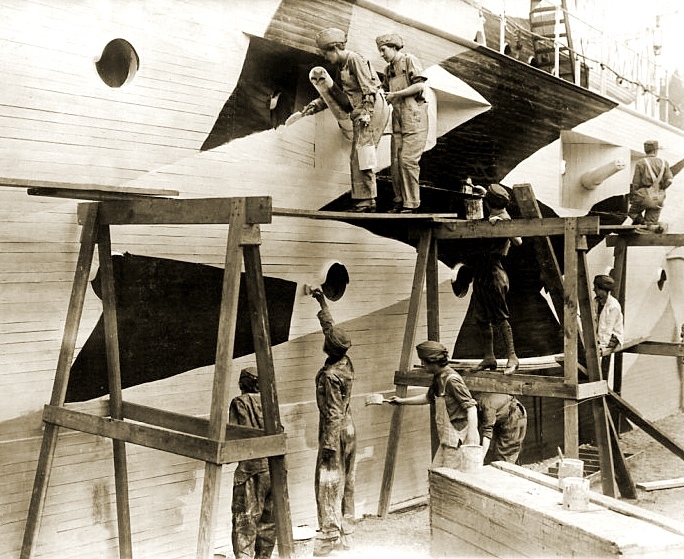 The strategy of this high-difference, dazzle camouflage was not about invisibility. It was about disruption. Confusion. Torpedoes in the Great War could only be fired line-of-sight, so instead of firing at where they saw the ship was at that moment, torpedo gunners would have to chart out where the ship would be by the time the torpedo got there. 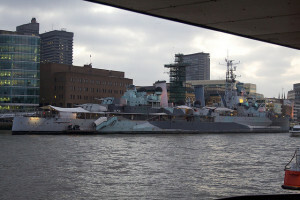 They had to determine the target ship’s speed and direction with just a brief look through the periscope. The torpedo gunner’s margin of error for hitting a ship was quite low. Dazzle painting could throw off an experienced submariner by as much as 55 degrees. An American “Women’s Reserve Camouflage Corps” did some of the painting. 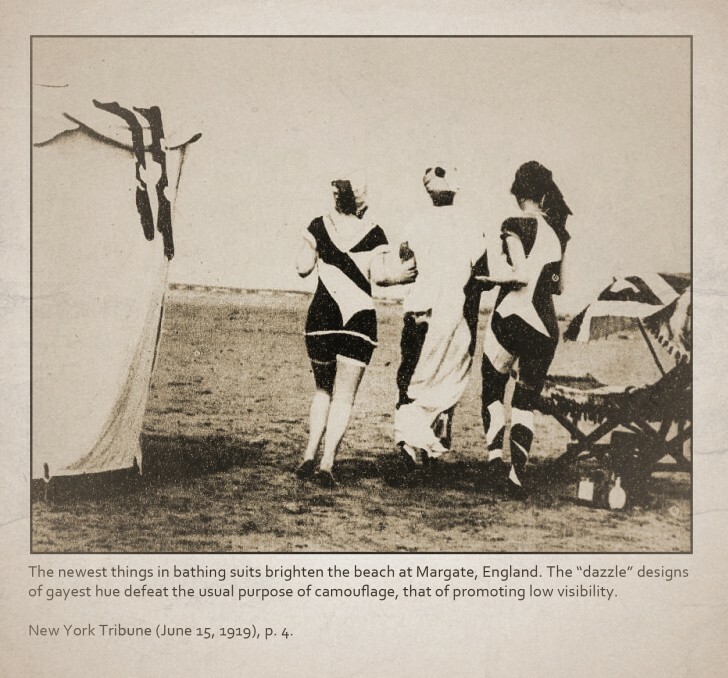 …but Dazzle also became an influence for fashion. Our expert this week is Roy Behrens, a professor graphic design at the University of Northern Iowa. 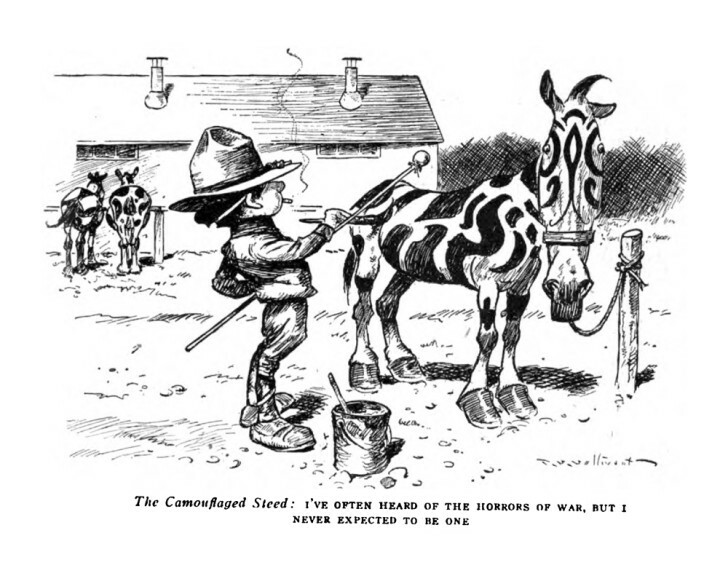 He’s published several books about camouflage, and also runs the Camoupedia blog. The theater of war has changed so camouflage has changed with it, but there is still dazzle to be found. But sadly, there are no longer flocks of sea-going Easter eggs. The fact that ‘modern art’ was being shown to the public at this time (WWI) made me think of something I read about Edward Steichen’s involvement with the Army Air Corp as a designer of camouflage for air bases in Europe. Steichen had been in the heart of the art world just years before when he studied and practiced his painting and photography skills in Paris and reported back to Alfred Stieglitz in NYC about all the new trends in the modern art movements. As far as I know he designed patterns of netting that were thrown over the aircraft to make them blend in with the surroundings since the planes were stationary. It would be interesting to know who the designers were for the razzle dazzle ‘cubist’ inspired patterns that the British used on their naval fleet. I also saw an on line source that located Paul Klee at an airbase repainting camouflage on German War planes for a while in the Great War. the given passages are so so easy to understand. I came across this and immediately thought of the Dazzle episode. In the surveillance society, how can we razzledazzle our faces? Thanks to you I have ordered a pair of Nike Dazzles! NICE RUNDOWN AND COMMENTARY ALTHOUGH I FIND THE BACKGROUND MUSIC UNNECESSARY AND INTRUSIVE . ONE THING THE COMMENTARY SHOULD HAVE STRESSED IS THAT DAZZLE THAT MADE THE SHIP APPEAR SHORTER WAS OF PRIME IMPORTANCE . THE VIEW THROUGH A PERISCOPE WAS OF NECESSITY BRIEF AND WHAT YOU SAW WAS GOVERNED BY THE WEATHER AND THE LIGHT LEVEL . IF YOU PUT YOUR CROSSHAIRS BEHIND THE BOW BECAUSE YOU COULD NOT SEE IT WELL AND AHEAD OF THE STERN THE SHIP WOULD CALCULATE TO BE MORE DISTANT. THIS, IN TURN, WOULD THROW OFF TORPEDO ANGLES OF ATTACK AND RUNTIMES . 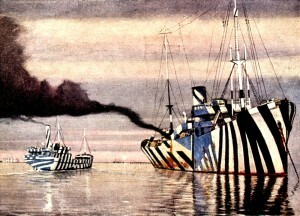 ANOTHER THING THAT SHOULD HAVE BEEN STRESSED WAS THE NEED TO USE A DIFFERENT DAZZLE PATTERN ON EACH SHIP OF THE SAME CLASS . 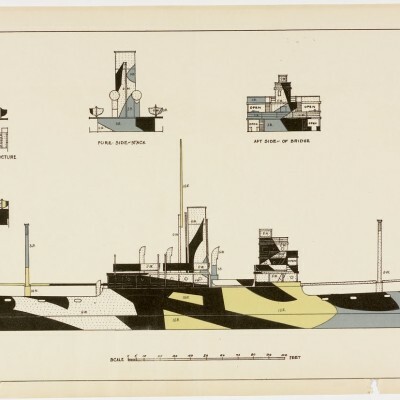 THE REASON IS THAT IN POOR VISIBILITY A SHIP CLASS COULD BE IDENTIFIED FROM THE DAZZLE PATTERN ALONE AND SOMETIMES THE DAZZLE WAS MORE VISIBLE THAN THE DETAILS OF THE SHIP ITSELF. 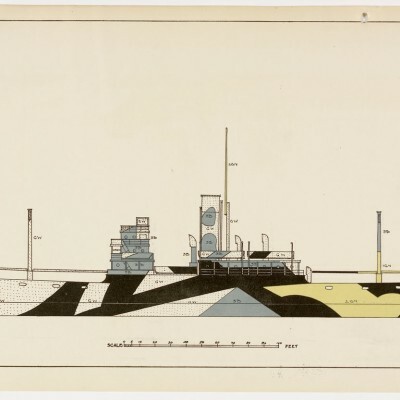 I was visiting the Henry Mason exhibit at the McLean Museum and Art Gallery in Greenock, Scotland last week, and one of the watercolors they have on display has dazzle ships in the background. I was kind of surprised to see it in documented in a contemporary painting. the latest issue of ‘interior design’ magazine (FEB 2016) had a very interesting cover!